Can you pick an old garment from a new one if it passed you in the street? I'm a lover of Mid Century Fashion - dresses and especially skirts from the 1950's and 1960's. Not only were these garments beautifully made, the quality of the fabrics meant they have lasted to this day. The floral skirt has resurfaced on the fashion scene of late with many of the prints resembling those from long ago. 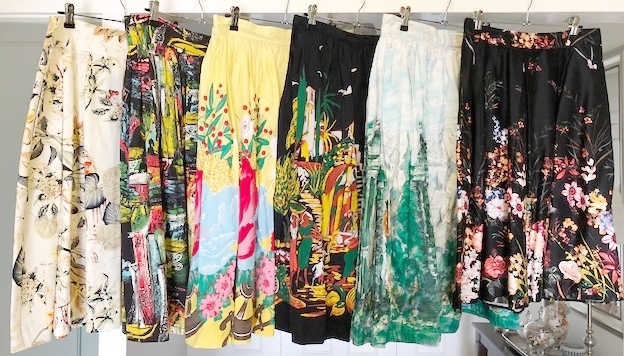 Floral and border print skirts. Which one's are old, which one's are new? Can you pick the the two skirts that were made in 2017? Hmmm....they're the skirts hanging on the far left and right. The other's are from the 1950's. You don't have to be a vintage devotee to wear the mid century fashion look. Nor do you have to style yourself from top-to-toe in vintage to have fun with it. Op shops, street markets and of course vintage stores are where you'll find a little gem that calls your name. My very first vintage piece purchased 36 years ago. A 1950's Bark Cloth Skirt with a metal zipper. The print is called "Paris Night Scene". And I'm still wearing it! The Border Print Skirt. A classic 1950's look with detailed images that started at the hem. The border print skirts of the 1950's often featured flowers, fruit, figures of people and depicted celebration. It's wonderful to have garments in your wardrobe that make you feel good every time they're worn - no matter how long you've owned them. Over time you create your own vintage!